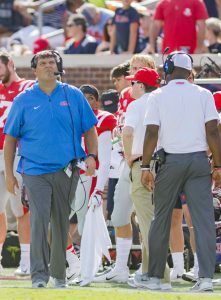 Since securing the Ole Miss head coaching position, Matt Luke has put a strong emphasis on building the Rebels’ future on the recruiting trail, an effort sparked by his “Mississippi Made” campaign. As of this week, Ole Miss has the 25th-ranked 2019 recruiting class according to the 247Sports composite. Although a top-25 class is nothing to scoff at coming off of NCAA sanctions, it is only good enough to give the Rebels the 11th best mark in the SEC following the early signing period in December. The Rebel class took a massive hit when two players from Horn Lake High School decided not to sign with Ole Miss. Five-star linebacker Nakobe Dean and four-star athlete Raydarious Jones opted, instead, to sign with Georgia and LSU, respectively, last month. After missing out on two high-profile players who reside a mere hour north of Oxford, the Rebels’ camp was hit hard again with the decommitment of now-five-star running back Jerrion Ealy of Jackson Prep. Ealy is a projected first-round pick in the 2019 MLB Draft, but he is also a highly sought-after football recruit and plans to sign with a school in February. Although the recent developments of narrowly missing high-profile Mississippi recruits have possibly dulled the luster of this class, the Rebels aren’t without some solid commitments under their belt, including 11 who signed in December and began classes at the university on Tuesday. Mike MacIntyre’s defense gained a leg-up in the early signing period by landing 10 players who are listed as defensive, including four-star defensive end Sam Williams, who is now enrolled in classes at the university after transferring from Northeast Mississippi Community College. Williams was joined by five other Mississippi early enrollees, including linebacker Eric Jeffries, who recorded 85 total tackles in his senior season at Lafayette High School in Oxford. The offensive side gained some firepower as well, including quarterbacks Grant Tisdale of Allen High School in Texas and Kinkead Dent of Jackson Academy in Jackson. Tisdale and Dent were joined as early enrollees by former Hattiesburg quarterback Jarod “Snoop” Conner, who signed as a running back. Ole Miss’ early signing period haul included 25 signees overall, 14 of whom are offensive players. After the early signing period and the decommitment of Ealy, the Rebels are left with three committed players who are expected to sign next month — barring any last-minute flips: wide receiver Jonathan Mingo of Mississippi’s Brandon High School, defensive end Brandon Mack of Jefferson Davis High School in Alabama, and offensive tackle Caleb Etienne of Warren Easton High School in Louisiana. Although Ole Miss has struggled mightily on defense the last few seasons, one of the most important recruits to hold on to among these three is Mingo. The Rebel offense is losing four receivers to the 2019 NFL Draft: A.J. Brown, D.K. Metcalf, DaMarkus Lodge and Dawson Knox. New recruit Mingo hauled in 77 receptions for 14 touchdowns in 2018 and has the potential to become a target early in his Ole Miss career should he stick with his commitment to the Rebels. Mingo currently has official visits scheduled to Ole Miss, Mississippi State and Florida State, as National Signing Day in February inches closer.